Debris swept away by the 2011 Japanese tsunami has carried hundreds of new species across the Pacific Ocean to the shores of America, a new study has shown. On 11th Match 2011 a massive sub-sea megathrust measuring 9 on the Richter Scale sent a 38 metre high tsunami surging ashore on the Japanese mainland. Alongside human victims, the Fukushima nuclear plant also fell victim when the water inundated generators needed to run the reactor's cooling systems. The aftermath of the event saw millions of man-made objects pulled out to sea, ranging from pieces of plastic and polystyrene right up to boats, bouys to sections of floating dock. Much of this material was already a thriving ecosystem colonised with diverse communities of marine life when the tsunami struck. As such, it generated a biologically-rich debris field that, once washed out into the ocean, began to move under the influence of winds, tides and other currents eastwards across the Pacific, offering as it did so a unique opportunity to track the fates of its living cargo. The results of this analysis have now been published in a paper in Science this week by Williams College researcher James Carlton. 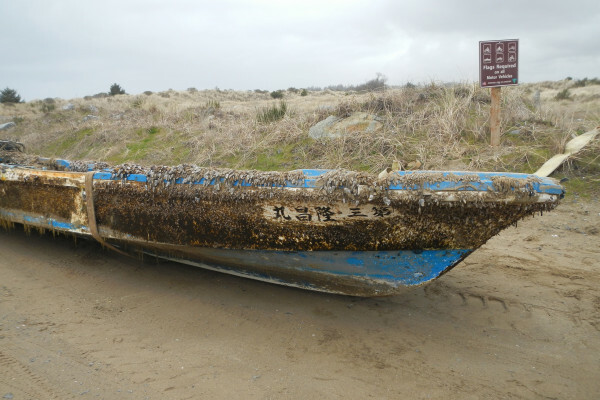 Over more than 5 years the Japanese debris traveled 7000 kilometres across the Pacific, making landfall along the US coastline from Alaska to as far south as central California. Carlton and his colleagues looked at the species clinging to over 600 beached objects from the tsunami, which first began to arrive in 2012 and were still washing up by 2016. They documented nearly 300 species of fish and invertebrates, including worms, crustaceans and shellfish, arriving from Japan in a reproductively-fit state, none of which had a track-record for rafting across oceans between continents previously. "It is surprising that living species from Japan continue to arrive after nearly 6 years at sea, 4 or more years longer than previously documented instances of the survival of coastal species rafting in the ocean," say the researchers. They attribute this in part to the long lifetime of the man-made life-rafts which these animals had turned into homes, which can remain afloat for far longer than naturally-occurring materials, like wood. The population density and diversity of the communities on the objects is also important to long-term survival, and the relatively-slow rate of transit (compared with, say a ship) also provides the marine "passengers" with opportunities to acclimitise during their journey. It's too early to tell whether these migrants will become invasive species or not. Some were known to have made the same journey previously by other means, but many are new and, as the team point out, their ability to survive and adapt to a challenging trans-oceanic journey marks them as resilient and adaptable, which are common characteristics among invasive aliens. Previous documented tsunamis have not been associated with a deluge of plastic waste and debris - and hence an opportunity for species movement - on this sort of scale. And as the team point out in their paper, "most of the world's megacities are in the coastal zone and will continue to be so, greatly increasing the quantity of non-biodegradable material available to be swept from watersheds... Human-mediated amplification of marine debris provides new opportunities for species to surmount historic ocean barriers." Next Zika and dengue virus "pregnancy test"
Invaders: From Gulf of Mexico, to Lincolnshire!